FileVault 2 is the all new disk encryption method that comes with Lion, and it’s more secure than ever, using XTS-AES 128 encryption on your entire disk, as opposed to just the user directory as in past versions. The other huge change that came with FileVault 2 is the significant performance boost, where using full disk encryption barely makes a dent on system performance. 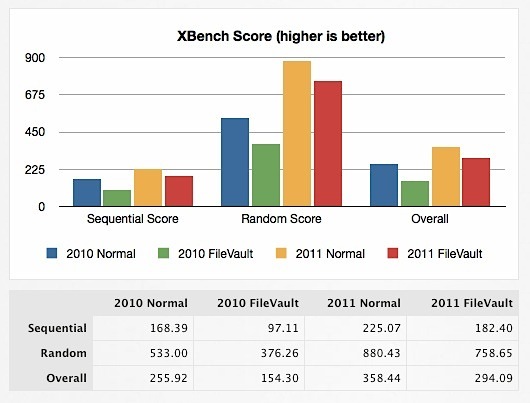 Just how fast is FileVault 2? See for yourself with these benchmark charts on a variety of SSD and traditional hard drive configurations. Impressively, overall read and write performance is barely effected despite the drive being completely encrypted. Your data is truly safe, without much performance sacrifice. it’s likely you won’t even notice that [FileVault is] on. The truth is, the benefits of Lion’s disk encryption far outweigh the nearly insignificant drawbacks, especially if you’re talking about a new laptop with an SSD in it. Those top two examples are SSD’s though, what about traditional spinning drives? Looking around, I came across Max Cho’s benchmarks, comparing the performance on a standard spinning 320GB Hitachi drive, and with the exception of a slower boot time, the results are practically identical, showing FileVault 2 is extremely fast on a traditional hard drive as well. Max’s results are also on a Core i7 MacBook Pro, showing that Intels AES encryption instructions built directly into the 2010+ Intel Core CPU lineup are extremely effective at handling on-the-fly decryption and encryption while barely impacting performance. Bottom line: if you have a Core i3, Core i5, or Core i7 processor, you’ll barely notice the impact of disk encryption, regardless of whether you’re using an SSD or traditional platter drive. Is a tiny performance hit worth the peace of mind of total data security? You’ll have to decide, but if you have sensitive data and a newer CPU on your Mac, it probably is. If you want to enable FileVault 2 yourself, you can do so in the “Security & Privacy” panel of System Preferences. You can even store the key with Apple which can be retrieved by answering some standard security questions, making it virtually impossible to accidentally lose access to your own data if you forget a password or lose the encryption key. My iMac is slower then my PC at everything it’s nice to know it does something fast. I have a 2.8 GHZ iMac with 16 GB of ram but it manages to consistently perform much slower than my 2.5 GHZ PC with 6 GB of ram. I guess patience is a virtue. You need to be more specific about which processor you have. The iMac uses a mobile processor. It is the same as a laptop. It is a laptop on a stick. It should not be compared to a desktop PC processor. Apple does not use desktop processors at all. Only mobile and workstation/server. So you cannot compare the clock rates. They told us to stop comparing clock rates about 8 years ago. Not quite; iMacs use desktop components for chipset and CPU, but do in fact use mobile graphics processors. Apart form that, only the laptop form factor RAM and the compact case sets them apart from desktops (read PC tower). Xbench is an antique. Get a real benchmark. Re the last post (“contrasts your findings”), see the very bottom of the test where someone reports that the bottleneck is with a specific ssd drive controller, presumably found on an older air, not with file vault specifically.